Teens! On Friday June 15, take a break from Regents week at the New Museum. Grab your friends and come for an evening of live music, gallery conversations, button-making, and other hands-on activities during the first ever Teen Night at the New Museum. Explore exhibitions by Phyllida Barlow, Klara Lidén, and Carlos Motta and discuss your ideas in conversations led by and for teens. Design unique buttons and then head up to the 7th floor Sky Room to experience the wild world of performance artist, poet, and hip-hop musician Mykki Blanco accompanied by DJ Physical Therapy. Teen Night at the New Museum is a G:Class program developed in collaboration with the NYC Museum Teen Summit. G:Class is the New Museum’s interdisciplinary art education program. G:Class empowers youth to think critically about global cultural issues and develop their own cultural perspectives and provides resources for professional educators to carry this forward. For more information visit gclass.org. The NYC Museum Teen Summit is a collective of youth leaders representing different museums in NYC dedicated to improving and promoting the role of youth in museums. For more information visit museumteensummit.blogspot.com. 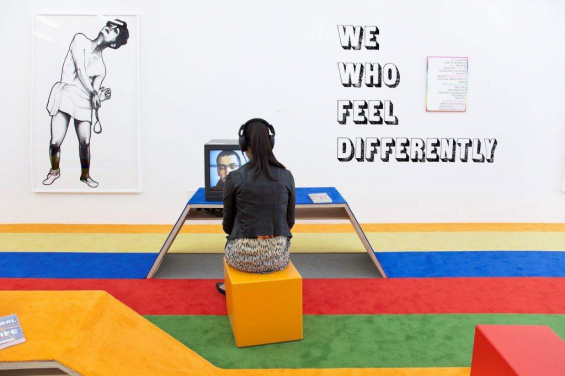 Support for Teen Night is made possible by The Keith Haring School and Youth Programs Fund at the New Museum. Generous endowment support for education and community programs is provided by The Keith Haring Foundation School and Youth Programs Fund, the Rockefeller Brothers Fund, the Skadden, Arps Education Programs Fund, and the William Randolph Hearst Endowed Fund for Education Programs at the New Museum.